Florists don’t need an introduction, and they are the only people who remain with us at good and bad times by offering us soothing comfort of – flowers. Most of these florists rarely indulge or mix up with other customers who live far away from their area. Today, they understand the importance of reaching out for larger audience and believe that only their goodwill efforts will bring them success. Over the years florists have started employing various promotional techniques to build upon their business such as festival discounts, festival freebies, and handing out typical promotional tokens. Florist magnets may be new on the scene, but florists understand that they possess immense potential and can be thoroughly employed for long and short term promotions. Flower Delivery Magnets – They are beautiful magnetic tokens, which offer you high hopes. They can assure a viewer that their delivery will be made on the same day after placing the order. Florists can get them customized with all suitable information such as contact details, and limited images of floral arrangements, etc. Florist Business Card Magnets – They strut out contact details and hold immense potential to transform any bland refrigerator surface. Florists can choose to get it customized with beautiful graphics, and spread fragrance of familiarity by offering easy reach- out details. 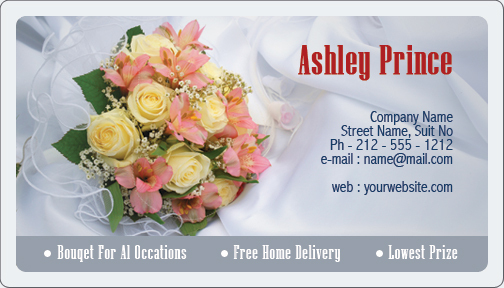 Unlike other regular business cards , a florist business card magnets possess high retention potential. Flower Bouquet Magnet – Flower bouquets mesmerizes us with their dazzling color combination and sweet aromas. Flower bouquet magnets also reprise the same charm and elegance by packing lots of colorful punches. And they can trigger your conscience whenever you plan to serenade your dear ones with beautiful bouquets or place in memory of your dear ones. This magnet can easily show up from your refrigerator door and will continue to soothe your senses with its visual presence. Florists can try out sea lot of options while indulging with these above mentioned choices. They can perhaps put it into best of use for building their business amongst a wide section of audience.